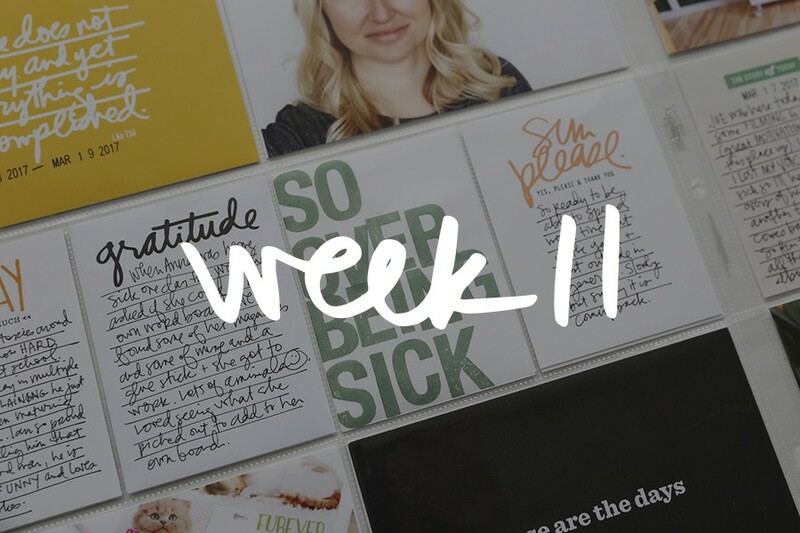 Welcome to Project Life | Week Forty-Six. I feel a bit like this week was a calm before the storm of the holidays week. Chris and I observed Simon during part of his school day which was a very informative experience. I loved watching him interact with one of his main teachers and was excited to get a shot of the two of them working together (I'm not sure that I have any other photos of the two of them together and she's had a major positive role in his educational experience in grade school). One insert this week - a 6x12 page protector with a bit of the top trimmed off to fit the recognition card Simon brought home from school. On the back I slipped in a printed email Chris sent me about Anna wanting ear-rings because she's a big girl and didn't have an "askidents" at school. A receipt from parking at the library, a piece of a Spanish coloring sheet Anna brought home from school, a tag from some jeans, a couple photos from my weekend, a response to one of my tweets from my friend Karen about Simon's "sparkle" and a couple photos of everyday life with the kids round out the week. 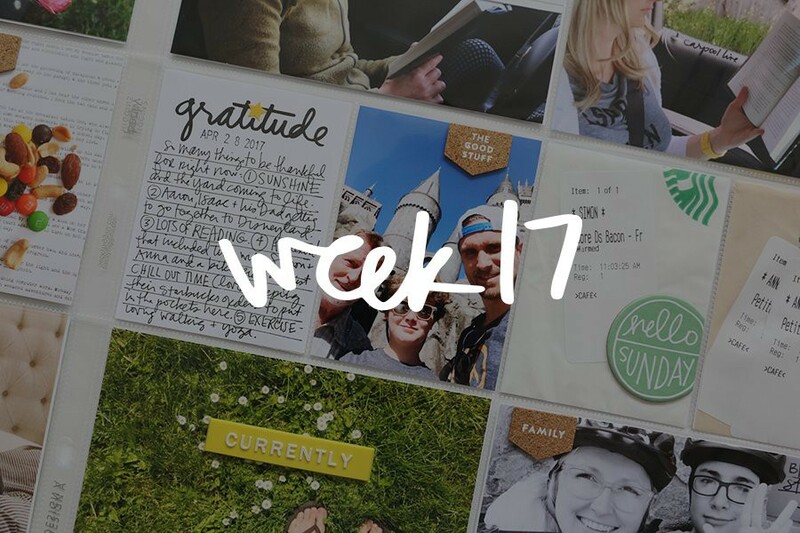 I also wanted to highlight a great post this week from Michelle Wooderson (part of the new Project Life Creative Team): Project Life | On Getting Behind, Getting Caught Up. Great week Ali, so happy for Simon!! such a great week of documentation, as always ali! I love the photo of simon with his teacher, and also the fact you included a funny story email! Great stuff! I SO love how all your weeks turn out. 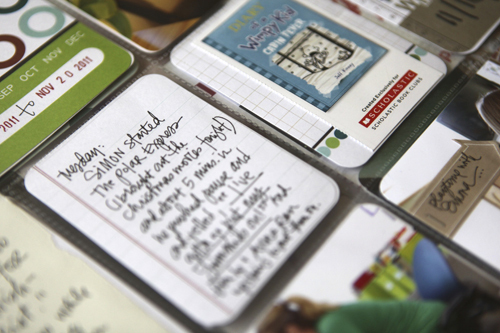 I just realized my stumbling block - I have no idea how to get photos printed efficiently, on a weekly basis! 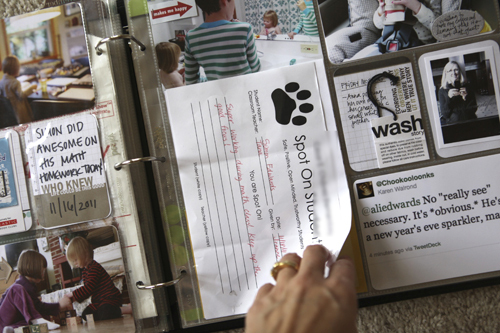 About to go scour your blog to see what you do for printing your photos! If I get that nailed.... the rest will happen! 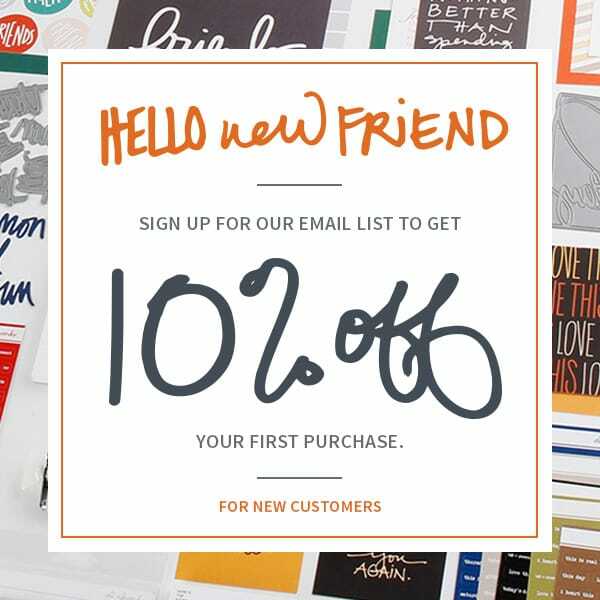 Your Project Life posts have been inspirational to me all year, and the decision has been made: next year I'm doing a Project Life project too! Thanks for the link to Michelle's blog! What a great post! I'm happy to report that I spent quite a bit of time on Sunday uploading photos to Costco for my PL album. There were well over 100 photos uploaded!! I picked my pictures up yesterday and sat down and inserted all of them into my PL album. I hadn't printed pictures or worked on my album since mid-July!! 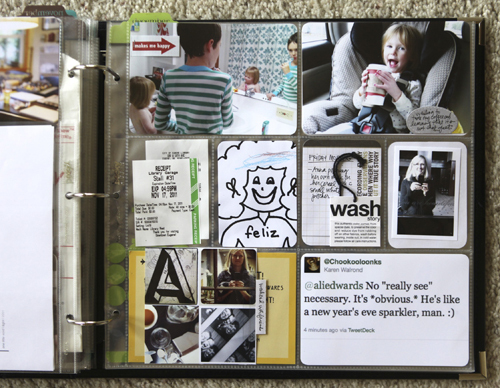 Since I already had my PL life album journaling cards and weekly cards dated and inserted, it was a cinch to insert my photos. Now all I need to do is take care of my journaling and add my ephemera (sp?) which I've been saving. I flipped through my album at least 3 times last night enjoying it. My dd flipped through it a time or two as well. I just LOVE PL!! I will also be separating my PL album into two albums since it is so heavy and full right now. I'm just about caught up...Yippee!! Blessings to you and yours and Happy Thanksgiving. 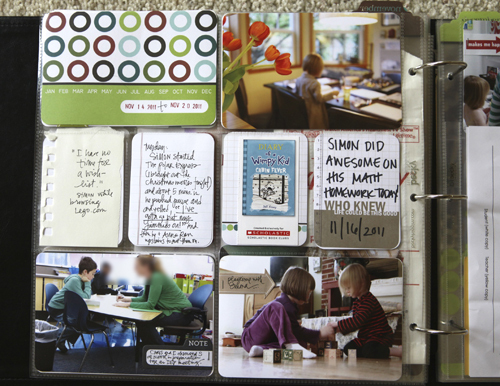 I love your Project Life posts and I have one question - I think before that you mentioned that you are including all of your 2011 layouts in several albums all together (Project Life and regular layouts). 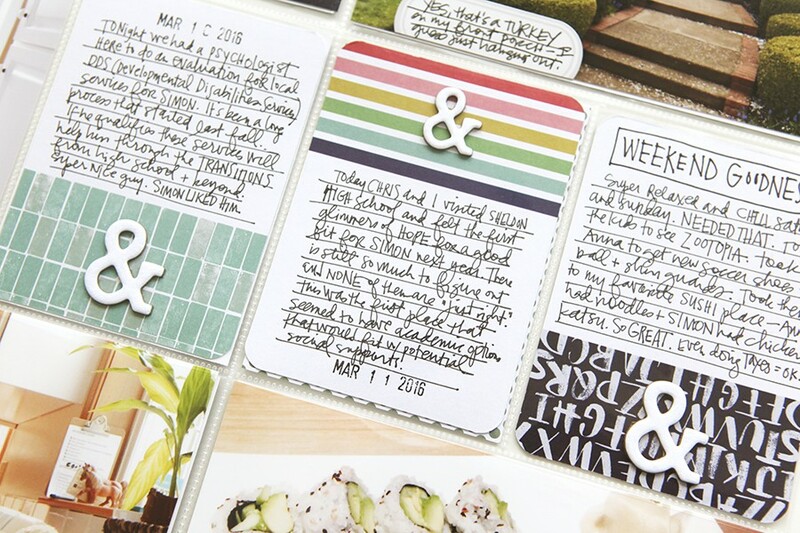 I wanted to do this too, but I am hung up on the fact that when I put a two-page layout between the project life pages, the front and back of the two page spread shows just the back of the cardstock. Do you put all of your "extra" layouts at the end of the album, do you do only one-page layouts, do you not care that this happens, or do you have a separate album for them? I'm trying to decide the best way to handle this. Hi Sara - when I first started this year I thought that I would combine it all together. 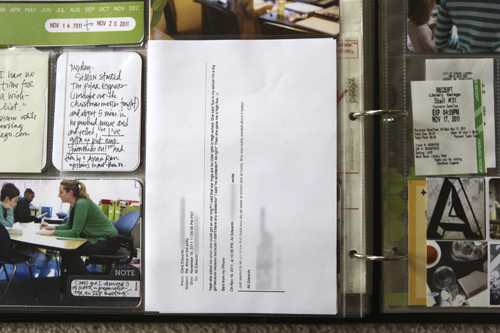 About half-way through the year I decided that I wanted to keep Project Life in it's own albums and other layouts in a 2011 Family album. That's what I ended up doing and I've been happy with that decision. Mother of another Diary of a Wimpy Kid fan here. He tried to read it slowly so it would last longer, but it didn't work. 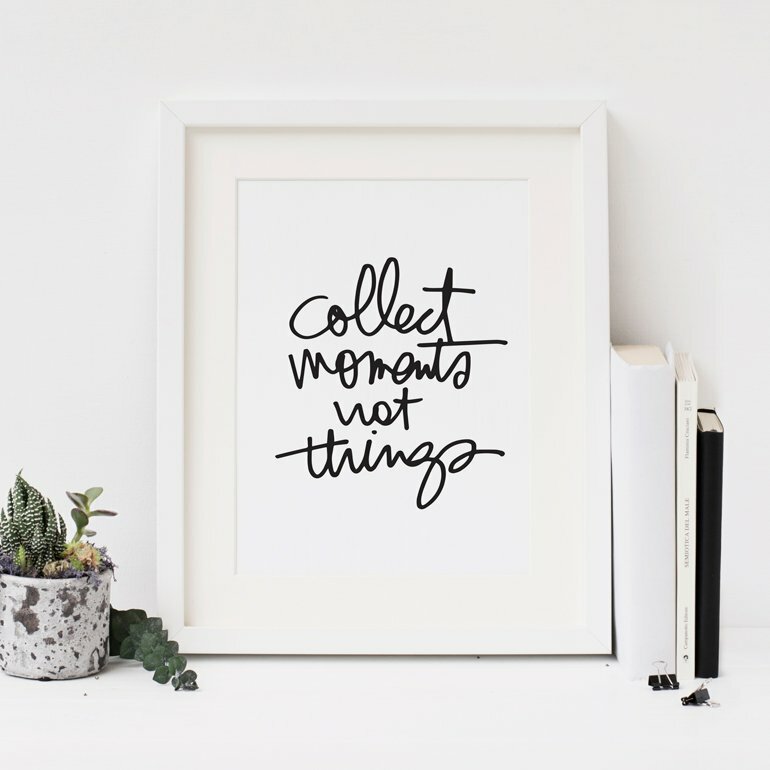 Just wondering if you know of anyone selling the Project Life Kit in Australia? I have seen it on Amazon, but they will not deliver to my home address.